, by Johnston, Peter H.
In productive classrooms, teachers don't just teach children skills: they build emotionally and relationally healthy learning communities. Teachers create intellectual environments that produce not only technically competent students, but also caring, secure, actively literate human beings.Choice Wordsshows how teachers accomplish this using their most powerful teaching tool: language. 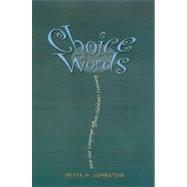 Throughout, Peter Johnston provides examples of apparently ordinary words, phrases, and uses of language that are pivotal in the orchestration of the classroom. Grounded in a study by accomplished literacy teachers, the book demonstrates how the things we say (and don't say) have surprising consequences for what children learn and for who they become as literate people. Through language, children learn how to become strategic thinkers, not merely learning the literacy strategies. In addition, Johnston examines the complex learning that teachers produce in classrooms that is hard to name and thus is not recognized by tests, by policy-makers, by the general public, and often by teachers themselves, yet is vitally important.This book will be enlightening for any teacher who wishes to be more conscious of the many ways their language helps children acquire literacy skills and view the world, their peers, and themselves in new ways.